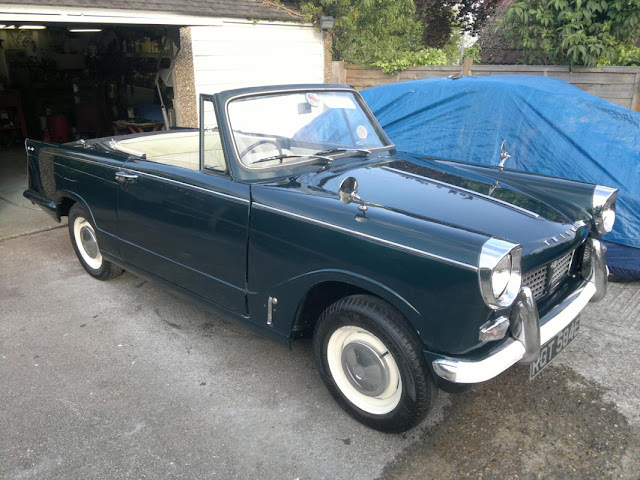 Sharon Endacotte used to own a Triumph Herald called Gerald. No more. Gerald and I have parted ways. It was one of the hardest decisions I’ve ever made. Once I’d placed the ad, part of me was desperate to pull it, to rush back to London and to throw myself in front of the car like Arthur Dent in front of the bulldozer and refuse to let anyone else take him, but alas there comes a time in classic car ownership where you have to look at your circumstances and your bank balance and do the honourable thing. For starters, my new home, which is in south Wales, has no off-road parking, and there are numerous local laws that prohibit working on a vehicle in the street… which is in any case somewhere I can’t keep a vehicle that is destined to remain SORN until such times as passing an MOT becomes possible once more. Then there are the time wasters. One bloke messaged me no fewer than seven times, asking various ridiculously detailed questions about specific parts of the vehicle, despite the ad explaining that it was on the opposite side of the country, yet when I gave him a contact number for the person fostering Gerald until he went to his new home, he just came back and asked for more information – this time, a parts reference from under the bonnet! It was at that point that I told him to either arrange to look at the car or to piss off. There was also the teenager who really liked the look of the car but couldn’t actually drive yet and had never worked on a classic before. I tried as gently as possible to discourage that one, but in the end, his attempts to bribe his mother with cups of coffee and warmed-up slippers failed, so that was the end of that. It sounds like mother really does know best. The point at which I decided to withdraw the ad was when someone started very patronisingly asking questions he assumed I would find difficult to answer on account of my not having a Y chromosome. Teenagers, time wasters and chancers I can deal with, but frankly, I couldn’t be arsed to deal with sexist idiots too. Fortunately, fate tends to step in at moments like this, and just as I was getting fed up with the whole thing, I got a message that someone who lived locally had taken an interest and wanted to have a look. I’d had people ‘take an interest’ before. Generally, that way was paved with tyre-kickers and people who’d make all the right noises but ultimately decide against it, or suddenly discover a pressing need to visit relatives in Outer Mongolia. Yet I got the feeling that I could trust this chap from the moment he first got in touch. He asked to come and have a look, and I explained that he’d need to arrange that with Gerald’s babysitter. Within 24 hours, he’d come back to me with an offer that was at the upper end of what I’d hoped to make on eBay. Twelve hours on from there, my mate had an envelope full of crisp new £50 notes waiting for me. My heart may have been heavy at the prospect of parting with my little car, but it was considerably lighter when I realised that I’d sold it to someone who would sort out the problems that had been building up and have fun doing it. I expected it to take a few months, but I also knew that under the shabby chic body was a mechanically sound little motor, and that he could do as little or as much as he wanted. Even I was surprised though, when I got the news just three weeks later that Gerald was rebuilt and back on the road with a spanking new Ministry of Transport certificate. You can see photos of the restoration here. It’s hard to feel too upset when a car that has been languishing for far too long is turned around like that, and he does look beautiful. Whilst the metallic British Racing Green paint isn’t exactly original, it does look the part – and it’s exactly what I’d been planning myself, once I’d fitted the replacement panels. Don’t suppose anyone fancies buying him back for me, do they?